8 Looking for a Social Media Agency? Today’s agency landscape is as varied as the brands and client engagements it represents. From advertising and PR to dedicated content production or community management teams, agencies of all types are brought on to handle a multitude of responsibilities within a client’s social media program. Whether you’re a social media agency providing full service social solutions or stepping in for a specific social campaign or project, today’s top agencies understand how to deliver results on social. And within a single social agency, each client engagement can call for a distinct setup. This product guide demonstrates how an agency team of any size and structure can provide impressive digital marketing offerings to help clients scale their businesses. These 7 strategies will help set your social agency apart from others and help you secure and scale new business. Analyzing each client’s audience may seem obvious. Gone are the days of pure qualitative research and good old intuition. If you have access to data-driven insights, you should be leveraging them. One thing to consider is the age of your clients’ target audiences. 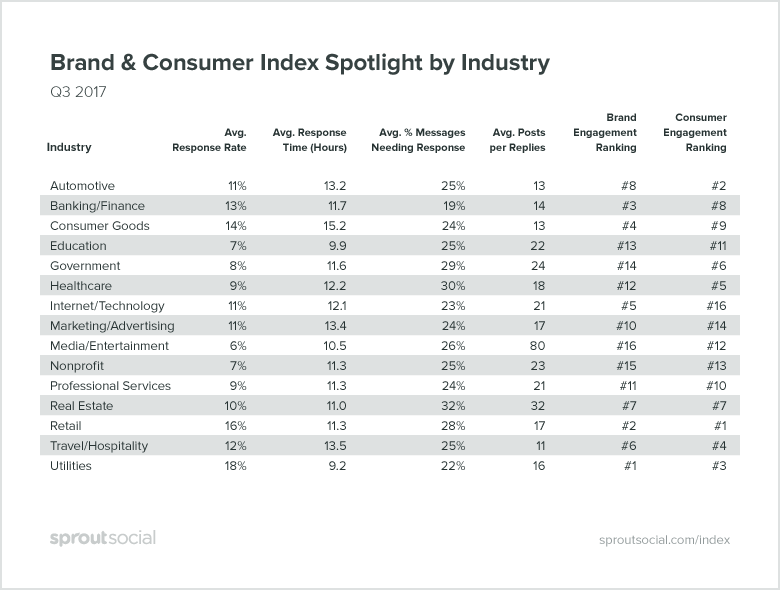 In fact, Sprout Social’s Q1 2017 Social Index specifically went into details on how different generations leverage social and interacts with brands they care about. 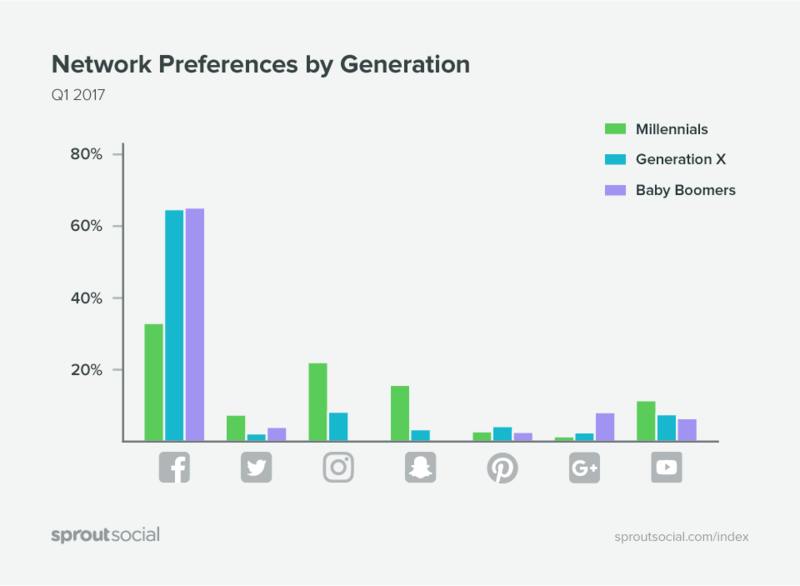 Below is an example of social network preferences by generation. 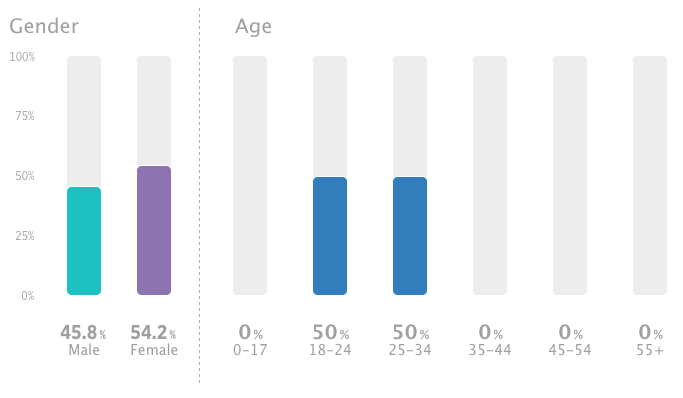 If you’re unsure of the demographic makeup of your client you can easily find out with a social media tool. Another way to analyze your clients’ demographic audience is with social media listening. This will show you the demographics of not just your social media followers, but of the people on social media who are actively discussing your brand. 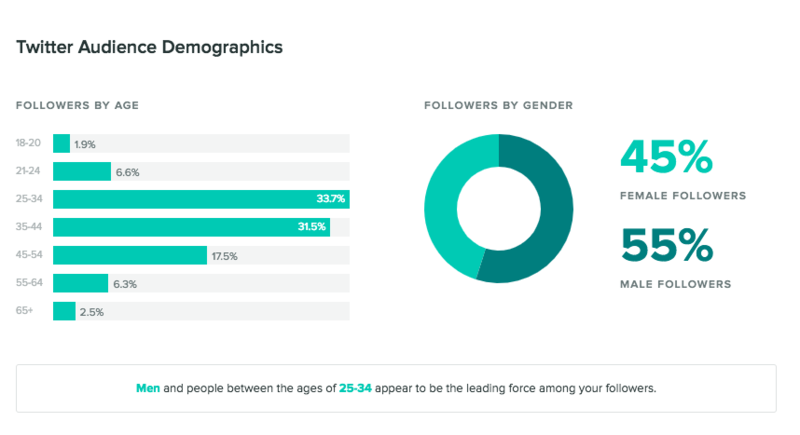 Not only can you find out the demographic makeup of your audience while using a social media tool, but you can also find out who your most engaged users are and who your brand is frequently mentioned with a tool like Sprout’s Trends Report. This information is invaluable to research when trying to determine not just who follows you, but who engages with you. 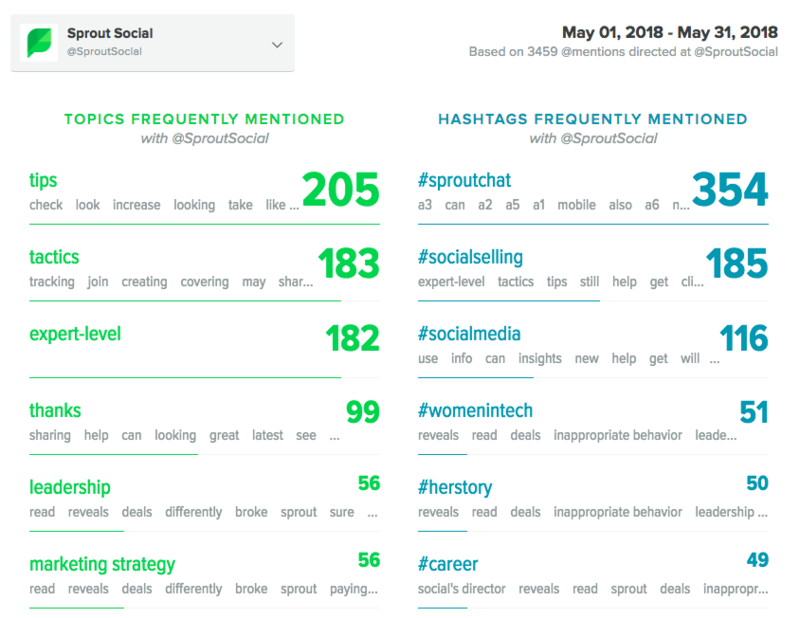 That same report shows the topics you’re most frequently mentioned with and the hashtags most frequently used with your brand. Think through who might be using those topics when building your audience, and click around the hashtags to get a better understanding of who is sending messages with them. If all else fails, ask your clients to setup some time with their most successful brands in order to figure out what their audience makeup looks like. Use a focus group to get more qualitative and anecdotal data on who their audience is, on or off social. Then use that information when pinning down your social audience. The world of agency marketing is incredibly competitive, but that doesn’t mean you shouldn’t collaborate with your peers. Agency marketers that team up and coordinate with other social agencies reap benefits over those that seclude themselves. Your inter-agency team may be your best bet for optimizing your social media efforts, since social is often the glue that holds disparate channel campaigns together. For instance, you may not be your client’s activation agency but by coordinating with whomever is, you can develop a plan for capturing and repurposing user-generated content (UGC) from your client’s events. Let’s face it, your agency won’t be a perfect fit for every single client. Or maybe you have a contact at a social media agency whose specialty is exactly what you need to make your client’s social media strategy better. Or, by passing leads that you can’t take on or that aren’t a good fit to a different agency you strengthen the relationship and chances they return the favor. Looking for some agencies to team up with? Check out the Sprout Social Agency Directory to find some of the leading organizations in the space. The Sprout Social Agency Directory consists of companies that are part of our Agency Partner Program. What’s the Sprout Social APP, you ask? Look around for all the programs relevant to yours and if it seems like a good fit, try and join! To close a deal as you’re pitching a client, it’s essential that you showcase past successes. Fundamentally, start by featuring a list of clients on your website, organized by name or vertical in order to make it easy to digest at a quick glance. From there, build out case studies and customer videos, featuring as many of your top clients as possible. An effective case study tells the story of your agency’s project with a client, highlights the challenges the client faced and your strategy for addressing them, shows how your agency provided a tactical solution and shares data points around the results of your efforts. Keep in mind when creating case studies to include as much data as possible. Your potential clients want to know how you helped others succeed and the results that came with that success. 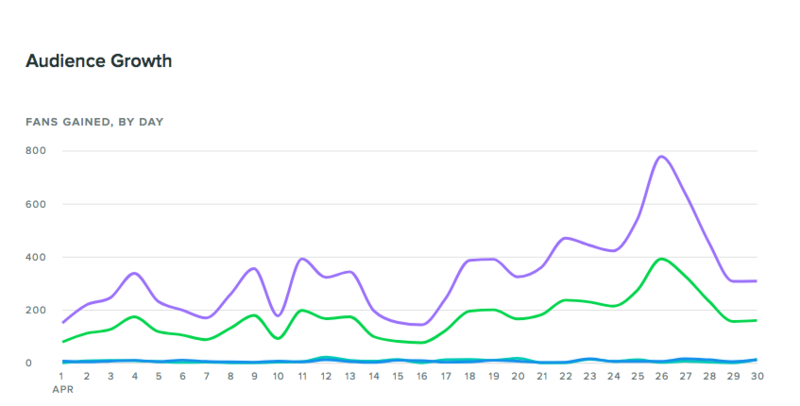 If you’re using a social media tool it should be simple to pull data to show how you improved a social presence month over month. If you have an “in” with a large company or agency, it could be a great opportunity to work with them on a piece of content that both organizations can promote for a mutually beneficial lift in reach. Here at Sprout we always make it a point to work with our agency partners to create joint content that we then share with our audiences. Once we’ve co-created a piece of content with our agency partners, both organizations get to work promoting it. Depending on the services your social agency offers, you may spend a good deal of your team’s time coordinating with your clients on what you should and shouldn’t post to social channels. Stay ahead of your content calendar with these two strategies. If you can sit down with your clients and identify a cache of approved creative assets , you can look for opportunities to repurpose that content when creating a content calendar. This content can be housed in an Asset Library for quick access to appropriate imagery. If you’re using a social media tool, chances are you can invite your client stakeholders into your account so they can become part of your content publishing workflow. Clients want to keep their finger on the pulse of what is happening with their social media campaigns and to have easy access to the data. Similar to getting your clients into your publishing workflows, you can give them direct access to social media reports by inviting them into your social media tool. Our scalable platform is flexible enough to power social execution and reporting for large agency/client teams or to grow along with smaller teams through our Agency Partner Program. How to re-position the dreaded "What is the ROI of social media?" question and show your clients real results they care about. The first conversation to have with your clients is ideally about their social marketing goals, the feasibility of those goals and what social success looks like. No campaign can (or will) succeed if you don’t know what success looks like, and you will never be able to scale your agency if you can’t satisfy client goals. Now, this may sound harsh, but bear with us as we walk you through an ideal process to start your client relationships and campaigns on the right foot. We dive into actionable strategies in Chapter 4, but if you can’t determine what your customers will achieve from your efforts then you won’t be able to prioritize those strategies. You’d be merely throwing spaghetti at the wall to see what sticks. That’s not how you create a great italian dish, and that’s not how you create a strong agency-client relationship. It’s a question all agencies and in-house marketers inevitably face, but one that is incredibly complicated to answer. While other digital channels like paid search, SEO or email may have a clear path to revenue generation, telling that story with social is more complicated. If you’re frustrated with having conversations around ROI with your clients just know that you’re not alone. 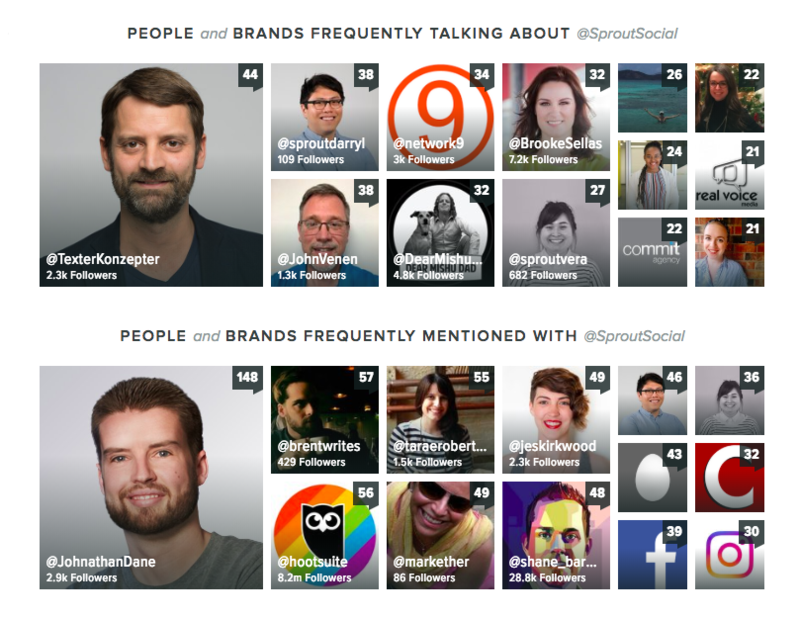 According to the recent Sprout Social Index, social marketer’s No. 1 challenge is still proving ROI of social media. In fact, only 14% of marketers say they are able to quantify the revenue that stems from social media. Don’t get us wrong, social media is definitely a channel you can generate leads and revenue with, and it’s one of Sprout Social’s strongest channels for driving growth. But know that social media is so much more than a place to blast messages. Marketers struggle to quantify ROI on social media because as a channel it plays so many roles. How can you successfully navigate the question of “What is the ROI on social media?” Start by defining your client’s goals and then discussing what impact those goals have on their organization as a whole. Ask them: What do you want from social? We say that social media is more than a place to blast messages and hope for revenue. So what else is it for? 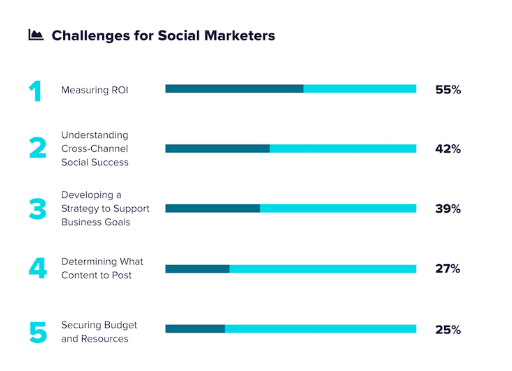 The Sprout Social Index dives into what social marketers’ biggest goals on social are. Use this as a jumping off point for working with your clients to figure out high-level goals. A campaign geared towards increasing brand awareness will need dramatically different KPIs than one aimed at generating new sales and leads. Here are some solid goals and the KPIs you can optimize for. Once you’ve chosen the metrics that indicate success you can set more quantifiable goals, but those goals should be based on historic values and a baseline. A client may tell you they want a million new impressions, but if you don’t know how many impressions they typically see then you have no idea if you should accept the contract or stifle a chuckle. Pro Tip: Use a social media analytics tool to audit your clients social media performance, including past impressions, clicks, growth rate, response time, response speed and more. Only then will you be confident in accepting, negotiating or rejecting a proposal. Throughout the relationship clients may ask you to benchmark their performance to others in their industry. This can be a challenging discussion if you’re not an expert in the specific industry they serve, but there are some things you can do. The Sprout Social Index pulls information on social media performance by vertical. Although this isn’t as specific as comparing a client’s social presence directly to a competitors, it gives enough information to compare their presence to the industry as a whole. Powerful social media listening tools can look through social media data to pull competitive insights on your competition. You can find data around how often each brand is mentioned, the impression volume, the general sentiment around the brand and more. Once you’ve secured a client and set them up with a social media analytics, you can begin tracking their profiles side-by-side to measure success. Stack up things like audience growth, message volume, response rates and more. As your campaigns take flight make sure to consistently review your social reports. Look closely at client’s KPIs and gauge whether or not they’re on track to miss, hit or exceed your clients expectations. Find ways to constantly optimize your strategy and take these lessons back to the client, but go beyond just telling them what works. Show them how to keep evolving with each interaction and soon enough, you’ll be ready to set your next goals. Export channel-, profile- and message-level data to inform your measurement efforts or build presentation-ready, white-labeled PDF reports to deliver straight to clients. Maintaining a collaborative relationships will increase their trust in your work, streamline your social media marketing and earn you loyal customers. Many agencies are used to being the “doers”—doing the publishing, the community management, the reporting—but as an agency scales and brings in new business, being the doer for every client isn’t always an option. There are only so many days in the week. To keep the communication strong and maintain a heavy hand in a client’s strategy and engagement, lean on your clients to jump into some of the more exciting conversations that are going on. The clients will love to see the happy customers they have, and you’ll love not having to answer every single message that requires attention. A shared asset library is a library of client-approved content that you can easily repurpose and publish without having to go jump through the hoops that some clients require when posting on their accounts. You can do this with anything from Dropbox, to Google Drive or a social tool with an asset library like Sprout. An asset library really simplifies collaborative publishing. 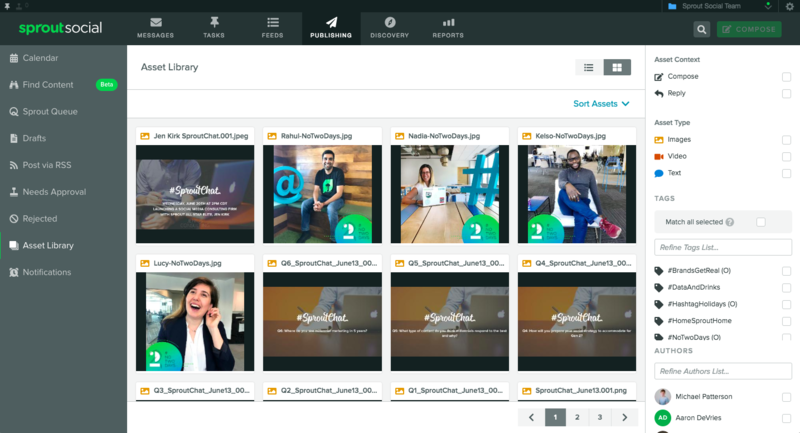 In line with the promise of a collaborative workflow for client and agency, an asset library lets you customize the experience of asset management. Sometimes a client just needs to see what they need to see. So to avoid overwhelming them in the library, make sure to sort different assets within a unique hierarchy, whether that be with folders or permissions. A joint asset library makes social media publishing seamless, and will inevitably save you tons of time on social media. You’re managing social inboxes for a client, diligently going through each message and come across one from a disgruntled customer. Whether that message needs a carefully-crafted response or needs to be escalated immediately, you need to establish a workflow with your clients for when these situations arise. Create a process wherein you can submit problematic social messages to the client as a task to align on healthy, on-brand responses easily. It’s not lazy to send things to your client, in fact, it automates and streamlines the sometimes tumultuous and lengthy process of manual damage control. Just make sure the client is set up to handle that message and include your suggestions for a response. Anything as easy as an email with your note can suffice. Without fully handing over the wheel, you can ensure you and your client are making decisions together as a team. Clients seek different things when it comes to reporting. Whether they’d like to know how their audience size is growing, how quickly their service teams are responding to requests or something else, there’s no limit to the amount of data you can pull from social media. Carve out time within your week to create or update these reports for your clients and send them over before they even have to ask. There are also social media reporting tools which will automatically send presentation-ready reports to your clients on a set time and day. The success of working with clients doesn’t come down to who takes the lead. It’s about building the brand together, consistently and collaboratively. Using analytics to make a few tweaks here and there within clients’ profiles platform to adjust to not only your agency’s needs, but your clients’ needs too, is a big step toward just that. Team tools and workflow management features like Tasks, custom tagging, message approval and live activity updates simplify collaboration. From multi-client social management for digital marketing shops to enterprise-level interagency teams, Sprout Social makes it simple and efficient to centralize agency social efforts on one powerful platform. As mentioned at the beginning of this guide, today’s social agency landscape is as varied as the brands and client engagements they represent. From traditional PR and integrated digital groups to dedicated content production or community management teams, agencies of all types are brought on to handle a multitude of responsibilities within a business’ social program. Whether providing full service social solutions or stepping in for a specific campaign or project, agencies understand how to deliver results. And within a sole social agency, each client engagement can call for a distinct set up—whether that’s one-to-many, many-to-one or collaborative. When agency teams need tools to implement these social initiatives for their clients, they use Sprout Social. With Sprout’s publishing, engagement and reporting tool sets, agencies can utilize one or combine all to meet their needs. In addition, as client portfolios grow and objectives change, Sprout’s flexible account structure and custom permissioning make scalable client management a reality. Let us show you the different ways Sprout can accommodate your agency’s working style. 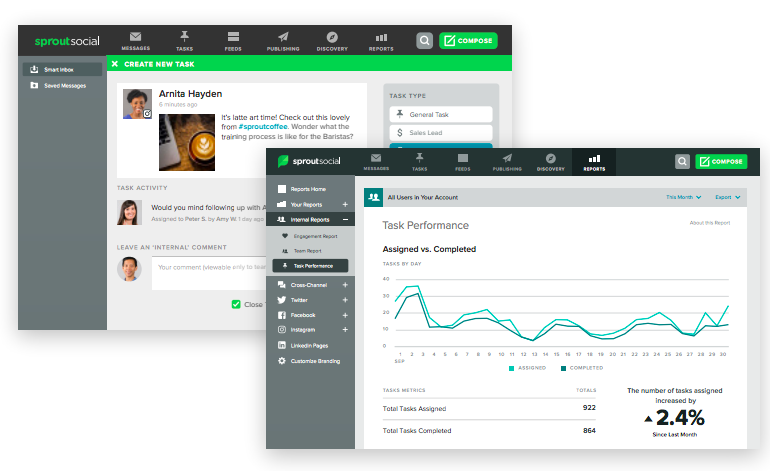 Getting your agency up and running in Sprout is quick and easy. It’s important to set parameters from the beginning so everyone understands their roles and responsibilities, and how they work together as a unit. 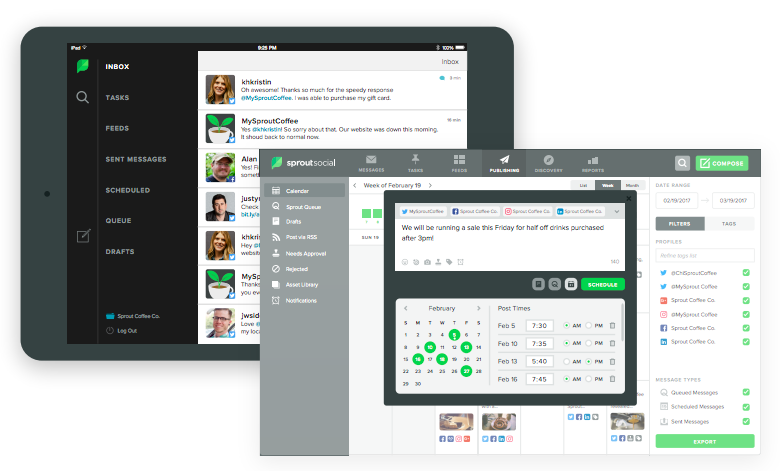 Each Sprout user has a designated role and different responsibilities on social. You can provide administrative and asset library access, assign to certain profiles and groups, and limit functionality in terms of publishing and reporting. You can grant team members and client-side contacts access to specific profiles, depending on their responsibilities, then organize those profiles into Groups. 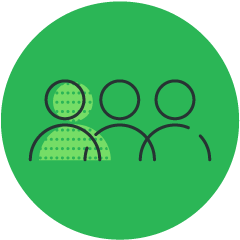 Using the flexible Group structure to set up separate, secure client environments makes managing a large client portfolio in Sprout safe and easy. Groups ensure publishing security and align individual users to applicable reporting insights. 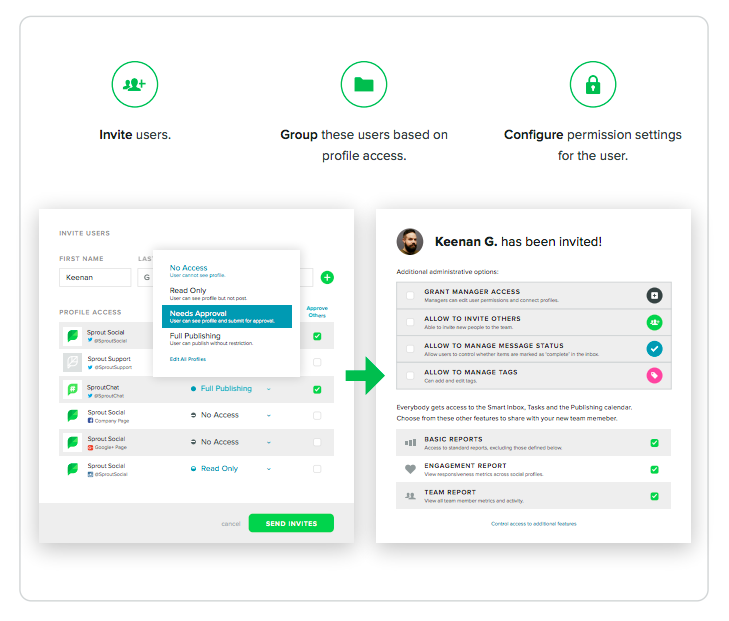 Setting permissions at the user level ensures the right person is handling the right message and assets. You have two opportunities to configure permissions: when inviting a new user or by going to individual settings screens for Users & Social Profiles and Asset Library. You can configure permissions based on publishing, reporting and administrative access to align with your agency’s and client’s responsibilities. Agency set up: A mid-sized agency with a client portfolio of local and regional brands works in teams of social strategists and Community Managers. Each Community Manager is responsible for fully managing social programs on behalf of four client brands each. 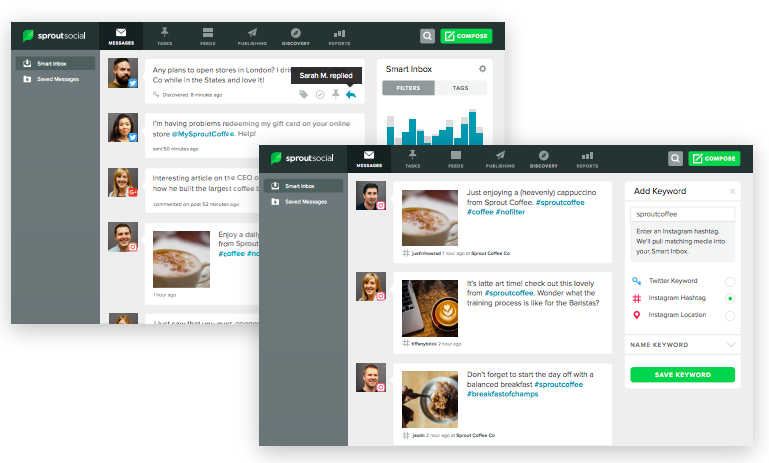 How Sprout powers the agency: Managing social media for all your clients is easy using Sprout. 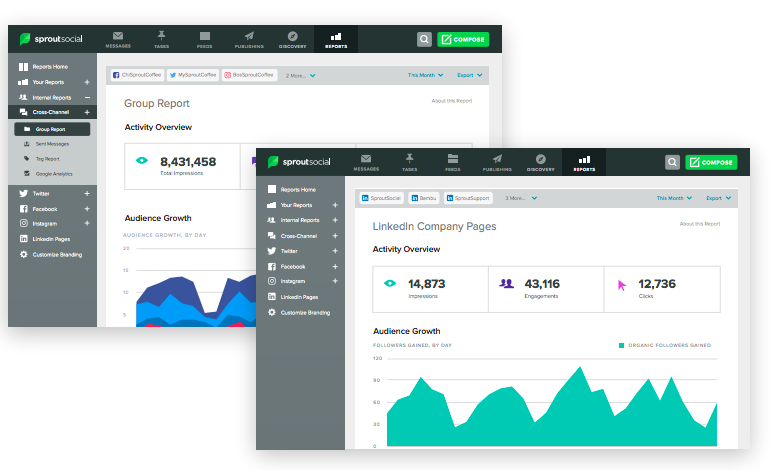 Your team can publish, engage and analyze all from one platform. To get the most out of published content, Community Managers use the Scheduler to publish time sensitive messages at a specific time; or use ViralPost to ensure your client’s audience sees content at the optimal time for engagement. Monitor and engage with incoming messages across all client profiles and networks using the Smart Inbox. Filter the inbox to concentrate on certain profiles, networks or message types, and mark messages as complete as you work towards inbox zero. The mobile apps enable each Community Manager to stay connected even while on the go; team members can publish and engage right from their phone. Agency set up: A large global agency with a client portfolio of international brands works in teams that are responsible for managing social campaigns on behalf of each client. How Sprout powers the agency: Social-driven campaigns are, by nature, high-touch from strategic planning through execution. Sprout enables teams to gather strategic insights during the planning phase, manage customer engagements during execution and analyze results post-campaign. Before your team starts ideation for a client campaign, the analyst uses the Twitter Listening Report to measure keyword volume in order to inform the campaign’s hashtag and creative strategy. Client approvals are streamlined using the Message Approval workflow, where stakeholders can approve or reject with feedback. When executing the campaign, the team uses the Asset Library, Message Tagging and Content Calendar to plan and organize outgoing social posts. Throughout the lifecycle of the campaign, the team also uses Message Tagging to categorize incoming messages, like those using the dedicated hashtag. Once the campaign wraps, the analyst uses the Tag Report to track volume, determine sentiment and analyze overall campaign performance to report back to the client. Agency set up: An agency with a client portfolio of national brands appoints a content marketing team to each client project. Each content team is responsible for planning, creating and executing content marketing strategies on behalf of each client. 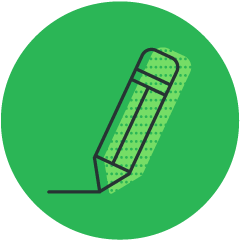 How Sprout powers the agency: Content, context and audience are the keys to a successful content strategy.. Sprout’s publishing toolset enables agency teams to create and publish content tailored to specific platforms and audiences. As your content team starts to create content, they use Compose to draft messages, including imagery from the Asset Library, then apply audience targeting to ensure the client’s messages reach the right audience. Client approvals are streamlined using the Message Approval workflow, where stakeholders can approve or reject with feedback. Once the messages are approved and scheduled, the team can identify publishing gaps using the Content Calendar, and repeat the process to fill those holes. The Sent Messages Report enables the team to analyze the content’s performance and adjust the content strategy as needed. Export the report to PDF for a presentation-ready version for your client or select the CSV file to further analyze specific KPIs and data points. Agency set up: A niche agency that focuses on multi-location businesses manages a portfolio of 25 franchise brands which maintain hundreds of local, regional and national social profiles. Each project team is responsible for managing customer care on behalf of the client’s entire portfolio of social properties. How Sprout powers the agency: Reactive communication and customer care is vital to building and maintaining social relationships. 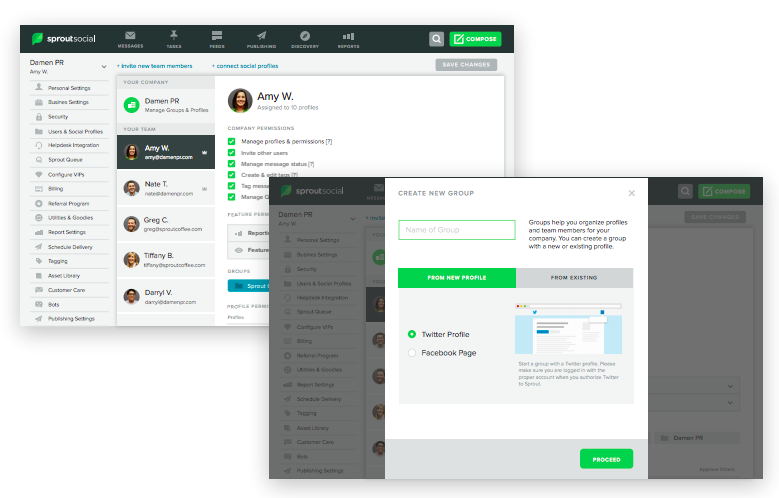 Agencies use Sprout’s engagement toolset to discover, manage and address incoming messages on behalf of their clients. The Smart Inbox is where your account team will monitor and engage with incoming messages across profiles and networks. Set up Brand Keywords so Community Managers can find and engage in conversations that are important to its client—such as campaign hashtags, location check-ins or even competitor names—but may not include direct mentions. As messages stream into the inbox, Community Managers collaborate with each other or with the client by assigning messages as Tasks to ensure the right person is responding to the message. Community Managers Mark messages as complete as the account team works toward inbox zero. Analysts use the Engagement Report to track response rates and times to meet the client’s engagement KPIs, as well as report on those efforts. Agency set up: An agency with a client portfolio of national brands appoints one team of analysts per client account, which is responsible for setting and analyzing social strategy on behalf of each client. How Sprout powers the agency: If your agency drives social strategy and execution for your clients, you need data to enforce its effectiveness. 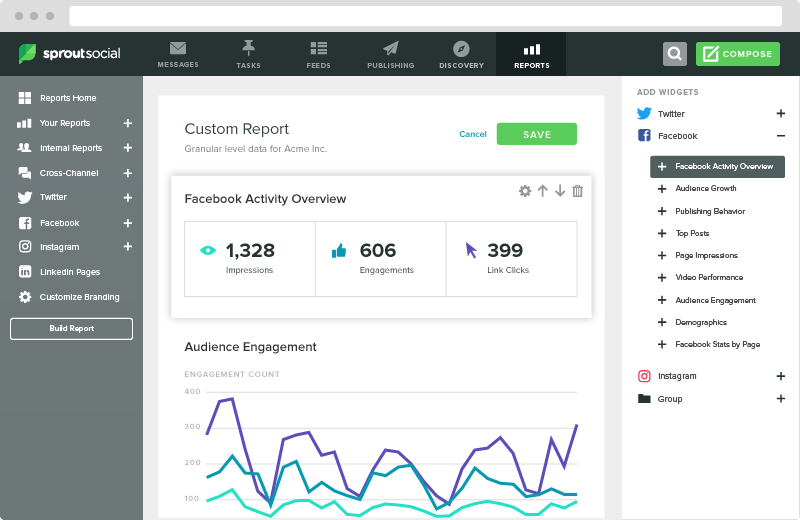 Sprout’s suite of reports enables your agency to prove its worth and use insights to tweak your strategy. The Group Report is a high-level overview that provides aggregate data across social networks so your client has a better understanding of social efforts as a whole. Pair the Group Report with the network profile reports—Twitter Profiles, Facebook Pages, Instagram Profiles and LinkedIn Company Pages—for an in-depth look at specific social channels. Use these reports to demonstrate growth and audience behaviors across all channels and profiles. Export the reports to PDF for a presentation-ready version for your client or select the CSV file to further analyze specific KPIs and data points. Agency set up: A mid-sized customer service agency with a client portfolio of national brands appoints Customer Advocate teams to manage customer care around the clock for each client. How Sprout powers the agency: Creating a wonderful customer experience is important for agencies focusing on customer service. Sprout’s customer service toolset enables you to execute and analyze your efforts. The Smart Inbox is where advocacy teams monitor and engage with incoming messages across profiles and networks. As messages stream into the inbox, the Customer Advocate Lead collaborates with the Customer Advocates or the client by assigning messages as Tasks to ensure the right person is responding to the message. Account Directors use the Task Performance Report to analyze Tasks usage and completion between teams and advocates. Account Directors use the Team Report in conjunction to track their team’s social performance with reply metrics by individual, across all profiles and across specific profiles. In today’s world, social campaigns and client engagements vary greatly; Sprout thrives in all types of agency environments. 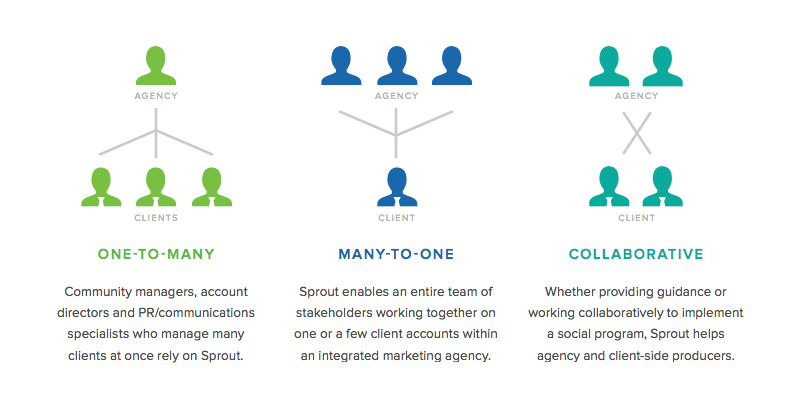 Agencies use Sprout to work on behalf of—and collaborate with—their clients. Sprout enables agencies and teams to plan and publish campaigns, manage social communities and conversations, and measure performance to demonstrate real results so they can win new business. 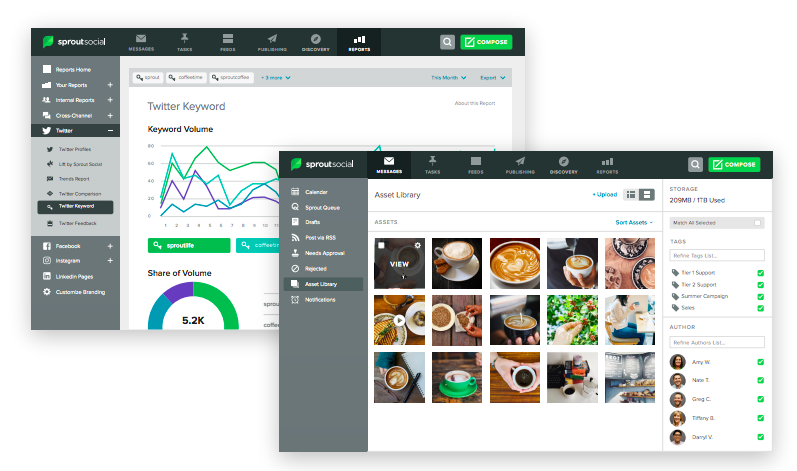 Partner with Sprout Social to define and validate Social ROI to your current clients, win new business for your digital marketing agency, and connect the world’s strategic social marketers together. Agency business is tough. While it’s rewarding work, #agencylife can sometimes feel like being on an island of your own. That’s where our Agency Partner Program sets out to bridge the gap and make things a little easier. During a recent visit to Sprout HQ, our partners were asked to describe their own experiences with the program—what they like, how it’s changed their business and how they feel as a Sprout Agency Partner. This is a fast-paced industry and keeping a finger on the pulse of the latest and greatest isn’t always effortless. But there’s power in partnership. Doing so enables agencies to reduce inefficiencies by leveraging resources and, with Sprout in the picture, full-suite access to enterprise-level social tools. 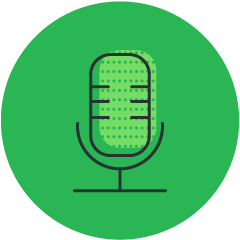 Having early access to Sprout’s newest product features and the ability to voice opinions on product development allows an agency to get to know the product inside and out. It helps not only our agency partners, but Sprout’s own team. Lucas Vandenberg, Fifty & Five Managing Partner, thinks the biggest value of being a Sprout Agency Partner is in having that extra access. “For us, giving additional feedback on new tools that are coming out is hugely valuable in understanding that the tool is really created and customized specifically for our needs,” Vandenberg said. Being a part of a program like this gives agencies like Fifty & Five a model for scalable pricing, as well as access to a whole team at Sprout who can really understand the intricacies of the agency business model itself. The Agency Partner Program is about more than leveraging resources and beta-testing product enhancements. Partnering through a program like this boils down to growing together, leveraging one another’s experiences as a community and gaining insight into what others like you are doing in the industry. In short, it’s a relationship. An open opportunity to interact and idea-share with other marketers like yourself is one community benefit, but Brooke Sellas, Founder and CEO of B Squared Media, feels it’s more the nurturing nature of the program that lends itself so well to creating a community. But Sellas stresses that it’s not just about getting on the phone to talk product or roadmap. It should come as no surprise that agencies are consumed with the marketing efforts of their clients. So much so that devoting time on their own marketing and business development can fall by the wayside. Tools like Sprout Social’s Bambu—a communications and curation tool—has proven to be a convenient method for helping agency partners share their content and expand their reach through activating employees as marketing and recruiting assets. DiVincent explains that before Bambu entered his agency’s world, the team was using multiple platforms to ensure that content was sent to exactly the right people. “Bambu took care of everything that we were already doing, but in one seamless platform,” DiVincent said. The platform has not only made sharing curated content easier, but has helped scale agency efforts as well. “We have contributors within our clients’ team that contribute in the Bambu platform but we could also have our agency team members contribute, so it allows us to grow at a lot faster pace,” DiVincent said. Fifty & Five’s Vandenberg explains that his agency has been opened up to new and great opportunities in the last year as a result of being a Sprout partner and building brand awareness as a vetted agency. “One of the ways the program has helped us grow is by giving us access to new leads and new prospects,” Vandenberg said. The Agency Partner Program believes that partnerships are built on mutual, sustainable growth and it is Sprout’s goal to continually support that. Are you looking for some social media inspiration? While this list is by no means exhaustive, here are some amazing agencies to follow. Whether you’re looking to hire an agency, or just need some inspiration for agencies that are doing a great job on social, check out just a few of the examples we’ve listed below and what some of their successes have been. Columbus, Ohio’s RAVE advertising agency is used to executing full-service strategies on behalf of clients, from video production and media buying to web design and SEO. But when it came time to join the effort to keep the beloved Columbus Crew Soccer Club in the Arch City, RAVE turned to the power of social media. The Sprout Social Agency Partner was able to achieve major results in a tight turnaround, and with a limited budget to boot, through a combination of smart strategy and powerful tools. Read more about their campaign that in the first month generated more than 1.8 million impressions, 102,000 engagements and 18,000 link clicks across Facebook, Twitter and Instagram. Bloomerang Solutions is a full-service digital marketing agency that specializes in the floral industry, serving small businesses and large conglomerates alike. In addition to developing websites and implementing pay-per-click strategies, Bloomerang provides clients cutting-edge social media support with the help of Sprout Social and automated chatbots. The benefits of chatbots work across industries, as evidenced by software provider Evernote. Using Sprout chatbots, the company achieved an 80% increase in people helped on Twitter per week. That value adds up fast when you consider customers spend 20% to 40% more with companies that engage with and respond to service requests on social. Their Twitter bio says it all. The individuals at Laundry Service “Make Amazing Sh!t”. Laundry Service has worked with an array of clients, and their portfolio boasts such brands as Hennessey, Amazon, Muscle Milk and Beats by Dre. One example of Laundry Service’s fantastic work comes with their partnering with Adobe to help promote their corporate responsibility initiative Project 1324. The initiative began by creating a global media strategy and social playbook for Project 1324, and enlisting relevant creative influencers to bring the brand positioning to life. In the 4 months after the campaign launch, Project 1234 saw 50M total impressions, 2.5M video views, 2.2M engagements and 80K new followers. Hearts & Science, an Omnicom Media Group agency, derives its name from the heart that they put into creating meaningful content, and the science that goes into pulling data and leveraging insights for their clients. Hearts & Science employees over 1,200 individuals and works with some of the world’s largest companies, like AT&T, P&G and The New York Times. 360i is an award winning marketing agency that creates work disrupting many spaces. Their work runs the board and they handle Insights & Planning, Search, Social Media, E-Commerce, PR, Tehnology and so much more. Recently 360i has been praised for the work that they are doing with voice search. For one such campaign, 360i teamed up with popular television show Westworld and Amazon Alexa to create an immersive voice experience that allows fans to work their way through a game with more than two hours of unique gameplay. Did you stumble across this post looking for an agency to manage your social presence instead of looking for agency tips? If you yourself are looking for an agency to help with your social media marketing efforts, check out the Sprout Social Partner Directory to find the perfect agency for your needs.